Want answers to your most burning questions about DeedGrabbing? Maybe they’ve been asked before! I’ve posted the most often asked questions here with answers. If the answer to your question is not found here, email us! What is the “catch” – don’t banks still hold title on houses that are mortgaged? There really is no “catch” – other than actually having to go out and do something! No push-button profits here or anywhere else in real estate. Most properties you find that are about to be lost to tax sale, will not have mortgages. Most of the time the bank will pay the taxes on behalf of the owner before they get delinquent enough to go to a tax sale. For houses that are mortgaged, the bank does not hold title to the property. They only own a mortgage against the property. You can get title from the owner without paying the mortgage, sell it for more than the amount owed on taxes and the mortgage, and keep the difference. In fact, you can leave these amounts owed until the closing and pay them out of your proceeds so you do not have to come up with them out of pocket. You must, however, be sure that you will be able to sell for more than the total amount owed by the tax deadline, or make it perfectly clear to the owner that if you cannot sell for a sufficient amount that you will not pay the mortgage and he will most likely be foreclosed. I know this sounds strange but I find owners all the time who are walking away from the property anyway and have already resigned themselves to being foreclosed. So they will sign the property off to you for a couple hundred dollars, and if you can find a buyer for more than the mortgage and tax amount you will make money. If not, you will lose your $200. Small price to pay for the chance to make thousands, with no additonal risk to you. You must understand the procedure to properly take a house “subject to” a mortgage before you try such a transaction. Beginners may want to stick to houses with no mortgage or consult with an experienced attorney or investor before proceeding on a mortgaged property. If someone owes loans on the property how can they just sign the house over to your name for $50, wouldn’t you end up having to pay for his loans? You can set up your deal with the owner where you do not promise to pay his mortgage, and you will suffer no consequences if the mortgage is not paid. Search “real estate subject-to” on the internet and you can get more information about this. Real estate is not like a car title, where you have to pay all loans before you can transfer the title. Getting a deed for little to nothing is great, but how do I know if it is free and clear? I don’t recommend doing any researching for mortgages or liens until you’ve talked to an owner who agrees to sell to you for a bargain price. Then ask the owner whether he is aware of any mortgages or liens. The owner is usually aware of any such liens. If the amount of the liens is too high for you to pay out of your resale proceeds, and still make a profit, then don’t buy the property. If the owner claims that there are no liens or mortgages, see if you can find any mortgages or liens yourself by searching your county’s online records (if they have them) or visiting the county in person. Just because you can’t find liens, don’t assume that the title is clear. However, you may discover something yourself that will save you the cost of a title report. If everything still seems clear at this point, you have a decision to make: whether or not to order a title report. If you’re paying more than $200 for the deed to the property, you really must order a title report from a title company before you pay the owner. On deals less than $200, I usually get the deed first and then order a title report later. The title report will show you everything encumbering the property, and then you can be sure of what you’re getting. If you bought the property for under $200 and did not order a title report, and later discover that there are liens, you will be out the money you paid the owner and the money you paid the title company, usually about $300.00. I frequently take losses like this in between profitable deals where I make $5,000-$10,000. I went to the courthouse today and they said I would need an attorney to get the info? Every state I’ve ever seen, has had a freedom of information law that will allow you to get the records you’re looking for without an attorney. However, government employees may not welcome your requests because it creates extra work for them. Read your state’s freedom of information act and figure out how you can use the law to get the records you need. Are tax offices online free or do you have to have a membership? Some tax offices post the information your looking for about their tax sales online. Most, however, do not publish this information online, especially if they are not a tax deed state. You do not usually have to pay money to access these records other than copying costs, and there is no membership needed that I’ve ever heard of. There are paid sites like taxsalelists.com that you can register for, and get lists there. Just be cautioned, they may not have the lists we need for DeedGrabbing, especially in tax lien states. I understand that my city uses deeds instead of tax liens. Is it possible to buy a deed without any up front money (find and assign)? Depending on your area, there may be a bunch of properties that people are walking away from. When you get the proper list together, try to edit it to eliminate as many garbage properties as you can. Then mail out to the rest of the owners. If they say yes, go get the deed from them. Don’t record until you check title and find a buyer. If title’s good, then find your buyer and close. This is much better than finding and assigning because you are in control of the deal at all times. When you try to assign agreements, the parties will often try to go around you and cut out your profit. This way you only have $50 invested and if you can’t sell it’s no big deal. There is a little upfront money and risk, but you can’t get odds like this at the casino! Are we not dealing with mostly run down properties? Do you usually find buyers for these properties? We are dealing with mostly run-down properties and land. However I have gotten some nice properties too. If you price a run-down property right, and you got it cheap, it will sell and you’ll make money. Who buys run down properties, it can only be bargain hunters/investors? Rehabbers buy run-down properties. Have you seen those shows on TV “Flip this House”, etc? People come in, buy cheap from you, then fix up and resell for a profit. People with good credit buy these all the time to fix up and move in or resell. A lot of people pay cash for these too. Can you rent the property and let other liens besides the tax lien fall off over time? How that would happen? Liens and judgments usually only have a life of 10 years. So if you get a property with some liens that are 7-8 years old they may drop off in a few years. Mortgages are a different story and usually do not drop off automatically. If the property is rentable, maybe you could buy it, rent it out for a few years, and let the liens drop off. Then you could resell it or continue renting it out. Once other people buy the tax liens, and we make a deal with the owner, do we have to pay the new lien holder original amount + interest accrued over that time? Yes you would, if you wanted to save the property. However, if you didn’t pay much for it, and you couldn’t sell it, you wouldn’t be obligated to pay the past due amount if you wanted to just let the property go. If an owner declares bankruptcy can the tax sale be put on hold? Yes. If you discover that an owner is involved in a bankruptcy which is in progress, you should not work with that owner unless you have good legal advice every step of the way. I have found that it is possible to work with owners who have a bankruptcy that has already been discharged. If I get a deed to a property that is about to go to tax deed sale for a nominal fee, do I now own the property and if so, is it free and clear (I am thinking it is not). If not, do I need to do a Quiet Title Suit? Yes you own the property if you got the deed to it. It is not necessarily free and clear. You would have to get a title report to find out for sure. 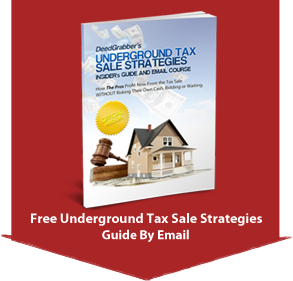 Titles do not get cleared by the tax sale unless the property goes all the way to a tax deed. Then you as the new owner would be wiped out, so it does you no good. You would not have to get a quiet title for the property, that only applies to properties bought at the actual tax sale, which we as DeedGrabbers will not be doing. Will this work in my state/county? I believe that you could make this work in nearly any state or county, as long as you contact the owners who don’t pay their taxes just before they lose their property. In areas with high property values, there will probably be less walkaway owners and properties in general, but more profit per deal you manage to do. In areas with low property values, there may be more deals than you can even handle, but profits on each deal will be less and you will have to be more careful not to overpay for property and any taxes/liens you’ll need to pay to keep or sell the property. Best thing there is to call it up on the county website. I done E-book I like to start making money from my county maricopa Az.